Join us for our Free Friday yoga class: April 26 from 6 - 7 PM at Yoga St. Louis! No registration is required. Please plan to arrive 20 minutes before the start of class. Our 'Free Friday' class is offered every other month, before the start of each new session. Come with a friend, and experience the Yoga St. Louis difference. Learn yoga step-by-step — correctly, safely, and effectively. Why settle for less? Daytime and evening group class sessions begin every two months throughout the year. We also offer two workshops (March & November), two week-long intensives (July & December), and private instruction. Profoundly influenced by the teaching and mentoring of the late BKS Iyengar — a Time Magazine Top 100 honoree, Bruce M. Roger shares his deep understanding of Iyengar Yoga. Iyengar Yoga reduces stress, tones the body, and refines the mind. Join us in class each week to experience the benefits. 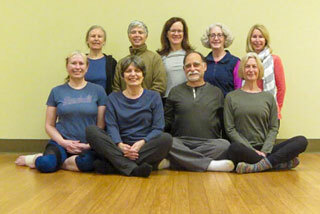 Annual Yoga Workshop: Join us Sunday, March 10, 2019 @ 9 AM-12 PM for our Spring Workshop. Prerequisite: Iyengar yoga class experience. Intro students welcome with permission of instructor. 28th 5-Day Summer Yoga Intensive: July 8-12, 2019. Suitable for students attending the Intro level class who want to broaden and deepen their practice in order to move up to Asana I. Get the latest news and post updates.